Comfort Cloth Adhesive Bandages - 1" x 3"
The Curad Flex-Fabric Adhesive Bandages are woven to allow them to stretch and conform to the wound. Material naturally breathes. Features even adhesion and a non-adherent island pad. Latex-Free. Sterile. 1" x 3". Sticks well and holds up. Sticks well and holds up. Sticks well and holds up. Any cut or scrape . Works well to protect cuts on fingers without restricting feeling thanks to the fabric. Stays on when subjected to wet or damp conditions. Good size for most needs. Leaves skin intact . Thin skin bleeds easily . when removed skin stays. 3 seniors live here. all have fragile skin. we use a lot of bandages. 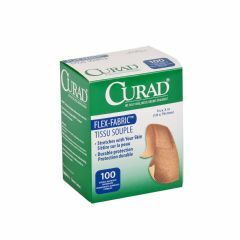 The Curad brand bandage is one of the few that does not remove my skin when I take the bandage off. It stays on well but is gentle on skin when removing. Glad to find it in a large quantity for the 3 of us. No. There are several sizes larger. This Adhesive Bandage has a gauze area that measures 15/16" x 11/16".